This incredible ring is flooded with luxury! The wide 18ct White Gold band is home to several glistening Diamonds and four Pink Tourmaline stones, which have a beautiful pink colour. 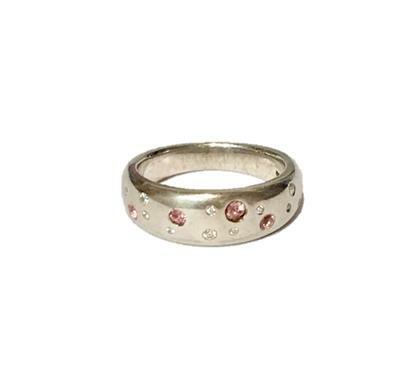 The stones are set into the band in an irregular pattern, making for a truly unusual ring! Perfect as an engagement or dress ring! LAST ONE LEFT IS A UK SIZE P!